A kind and observant client has brought it to our attention that travel agents sometimes use jargon to describe features of a proposal which leave the client confused. Because we hear these terms frequently we assume everyone understands when we talk about a trip using buzzwords with lots of cachet for those IN the trade. We forget that these words can confound people rather than inspire them. That is not the direction we want to go! Today I offer the first installation in what will be an occasional feature on travel terms. I uncovered so many questionable terms I decided to divide them into categories. Today I will de-mystify terms used to describe hotels and resorts. Congratulate yourself if you already know them all; or tuck away for future reference the ones which are new to you. Property – A resort or hotel. “This property is especially romantic,” refers to everything about the establishment, not just the real estate on which it sits. All inclusive – Meals, snacks, drinks, and activities are included in the rate quoted to you. “All” usually does not mean 100% however, as there might be an additional charge for scuba diving, spa treatments, motorized water sports such as water skiing, and up-market labels of liquor or imported beers. Inquire what is not included in the “all-inclusive” price. Amenities – Hotels and resorts offer particular benefits to guests if they were booked by an agency in a special relationship with the hotel/resort. Guests booked by Virtuoso agencies such as my own Vista Travel might receive a free breakfast, a room upgrade, or a credit to use in the spa or restaurants. Virtuoso affiliated properties offer many other amenities unique to each place. This can be a significant additional value. Suite, Junior suite, Double double – These are types of rooms you could reserve. A suite should have a separate living room area which can be closed off from the bedroom. A junior suite has a living area with a small couch but this is open to the bedroom. A double double is one room with two double beds. 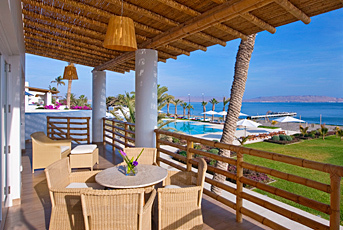 This is the view from a Superior Ocean View unit at Hotel Paracas in Peru. Guarantee and Deposit – Unless you are prepaying your stay at a property they will probably want a guarantee or a deposit when you make the booking. A guarantee requires your credit card so that they can charge you if you do not show up to stay there as reserved. A deposit allows the property to charge you for the first night stay when you make the reservation. They keep the money if you cancel after a particular time. P.P.D.O. – Per person double occupancy. An ad in the Sunday Travel section might say the cost for three nights is “$399 p.p.d.o.” Two people staying on that package would pay a total of $798. If you ask for the same plan as a single traveler you will pay more than the quoted rate. 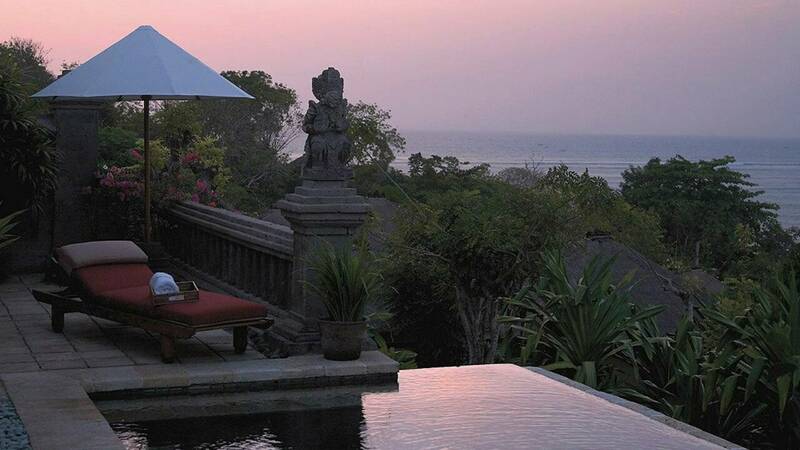 This infinity plunge pool is at Four Seasons Jimbaran Bay in Bali. Infinity pool – This is a swimming pool where at least one side has no wall above the waterline. Water usually spills over the edge and from a distance it looks like the pool goes on forever. Plunge pool – This is a small private swimming pool (maybe only six feet square perhaps, but deep) designed for a quick dip to cool off. These are often attached to rooms at especially romantic resorts. Check out this display of infinity plunge pools at Jade Mountain resort in St. Lucia. If you have encountered other obscure terms not covered here, let me know and I will include them in future installments. We try to paint a clear picture of our stellar offerings. We really do not want to scare you away with confusion! This entry was posted in Travel, Uncategorized and tagged all-inclusive, amenities, hotels, infinity pool, junior suite, plunge pool, resorts, suite, travel, Virtuoso. Bookmark the permalink.